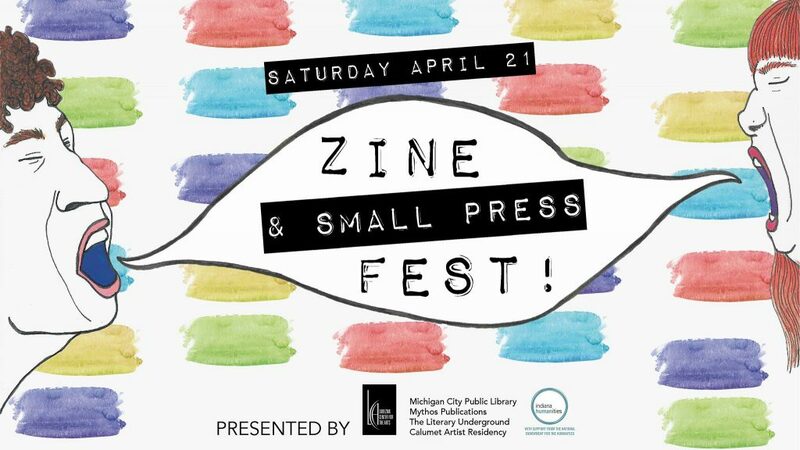 Lubeznik Center for the Arts teams up with regional organizations Michigan City Public Library, Mythos Publications, The Literary Underground and Calumet Artist Residency to bring a Zine & Small Press Fest to Michigan City. On April 21, 2018, Lubeznik Center for the Arts welcomes independent authors, publishers, artists and activists to present and revel in a wide range of printed artistic expressions. Public offerings include a hands-on workshop, keynote address, panel discussion, vendor tables, original zine art exhibit, poetry readings, storytelling and music. Michigan City Public Library at 100 E 4th St.
Lubeznik Center for the Arts (LCA) at 101 W. 2nd St.
Artspace Uptown Artist Lofts at 717 Franklin St. The day’s planned activities and exhibits will begin at the Michigan City Public Library, 100 E 4th Street, at 10 a.m. with an interactive, family, zine-making workshop. This event is suitable for all ages and runs until 12 p.m.
Lubeznik, located at 101 W. Second Street, will be a flurry of activity beginning at 12:30 p.m. with a keynote address presented by Dr. Fred Wright. Fred has written extensively on zines and popular culture, including “From Zines to Ezines: Electronics Publishing and the Literary Underground” exploring how online publishing affected the subculture of zines. He published the literary zine entitled drinkdrankdrunk and wrote reviews for Zine World: A Reader’s Guide to the Underground Press. He has taught at Kent State University, Muskingum University, Cuyahoga County Community College, and Ursuline College. Fred has presented at conferences and published articles in journals such as The Journal of Popular Culture. His last zine was a serialized novel about a rock band. He publishes his novels under the pen name of Wred Fright. His latest is Frequently Asked Questions About Being Dead. A curated lineup of poets will read their works from 3:00 – 5:00 PM. All the while, in the main gallery from 1 to 5 p.m., 40 zinesters, small publishers, and independent authors will offer up their wares for sale or giveaway, everything from tiny handmade books and zines to professionally bound soft and hard-covered books. These independent publishers represent unique and diverse perspectives in their creative projects. There will be something for all ages, all walks of life. Throughout the hours of activity at Lubeznik, there will be access to Material Culture, a curated exhibit to accompany the Zine and Small Press Fest. The exhibit will remain on display through May 19, 2018 in the NIPSCO Education Studio. Material Culture explores the varied media and methods of zines and self-published materials from comic books and graphic novels to community and environmental activist projects and poetry and photography zines. A wide variety of zines and self-published materials from those participating in our Zine and Small Press Fest on April 21st, as well as student works from Lubeznik’s after school arts programs and works from students of Indiana University Northwest and Purdue University Northwest. Also on display will be original artworks and prints from regional zine artists affiliated with Mythos Publications of Hobart, Indiana, a collection of zines and published materials from Calumet Residency of Gary, Indiana, and original comic books from the Chicago’s Hairy Who art movement. The festival celebrations continue into the evening at the Artspace Uptown Artist Lofts, 717 Franklin Street. Doors will open at 6 p.m. Kicking things off at 6:30 p.m. will be a storytelling hour hosted by radio host, creative consultant, and author Gregg Fraley. Poetry readings and performances will follow, featuring a number of accomplished poets including William Taylor Jr. (San Francisco), Iris Berry (Los Angeles) and Michael Grover (Florida). The event comes to a close with a musical performance by singer/songwriter A.S. Coomer. This event is intended for mature audiences. There will be light snacks and a 21+ cash bar. All festival events are free of admission charges. For more information, please visit the LCA facebook page at https://www.facebook.com/LubeznikCenterfortheArts/. This program has been made possible through a grant from Indiana Humanities in cooperation with the National Endowment for the Humanities. Kayla Greenwell, Lily Rex, Kei Constantinov, Bill Yarrow, Janine Harrison, Carol Estes, Joseph Pete, Tina Porter, Briana Olivares, Miranda Morley, Matthew Barron, Joe Gianotti, Wendy Lee Spacek, A.S. Coomer and Fred Wright. @ 7:30 Featured Poets: Ezhno Martin, Jeremiah Walton, Dan Denton, Krista Cox, William Taylor Jr., Iris Berry and Michael D. Grover.